When I was a boy, growing up in Indiana, the month of May was filled to the brim with news coverage of the greatest spectacle in racing. Once I grew up that nostalgia died and the mysticism surrounding the whole race fell apart even further when I actually went to the race track and realized it was far better to watch on television than it was to actually be there. However, that boyhood wonder still retains the memories of a video game that brought me many hours of fun, as well as made me feel like I was actually part of the May festivities. Many names are associated with the Indy 500, but for me Al Unser Jr. stood out among the crowd with Al Unser Jr.’s Turbo Racing. I absolutely loved the game then, and I still quite enjoy it today. 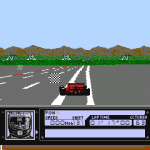 While many racing games on the NES are the same, Al Unser Jr.’s Turbo Racing felt different, perhaps only through Indy 500 tinted glasses. 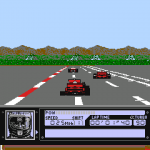 Sure it looks exactly like almost every racing game on the NES, but Al Unser Jr.’s Turbo Racing added things that, at the time, I had never seen in an NES racing game. 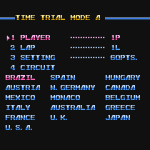 The player was given the option of two different Time trial modes as well as a Grand Prix mode, which set the player off on a pseudo career as an Indy car racer. 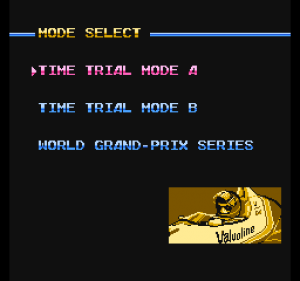 Time trials are fairly standard in NES racing games, and gave the player the chance to learn the curves and get the best time on each given track, but Grand Prix mode was where this game set itself apart from other NES racing games. 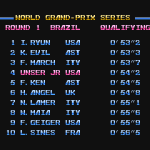 In Grand Prix mode the player could race against or as Al Unser Jr. himself, although I always found it more fun to input my own name and race against Little Al as they used to call him. You set out to race across sixteen tracks and earn as many points as possible. Depending on how well you place within the race you are given points to upgrade a few aspects of your race car, making it easier to place better in future races. 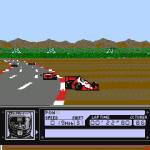 Along with being able to upgrade your car, the player is given a certain amount of turbo to boost past other drivers in those crucial moments of the race. To use the turbo the player must be in top gear and continue to hold up on the D-pad. Which is another thing about this game that I admire greatly; manual gear box! 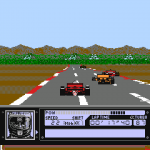 Most NES racing games are either automatic or hi/lo, while Al Unser Jr.’s Turbo Racing is a three speed manual gear box, which only made that feeling of actually being in the race that much stronger. Should you run out of turbo, don’t worry! Turbo can be replenished by making a pit stop. 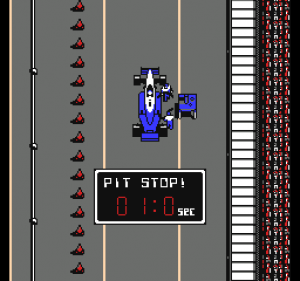 The entrance to pit road may be a bit confusing as it’s only denoted by small P flags and red cones, forcing the player to shove their car to the right to engage the pit animation, but after a few races you’ll get the hang of it. During a pit stop the player can choose to repair their car or refuel their car. This will take more time, depending on what all you choose, which will ultimately lose the player some, not many, positions in the racing field. And finally, let me talk about the A.I. in this game. To put it completely bluntly, they can sometimes be complete assholes. I’m not going to sugarcoat this here, they just can be. Opponents will bump you off the road, duck, dive and cut in front of you and all you can do is wreck and hope you recover quickly enough to catch them on a straight and pass them. 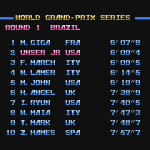 Unlike most NES Racing games this game does have quite a gap before the player, once they’re in first place, catches up to the tail of the field. Even so, the last place cars can still be ruthless! 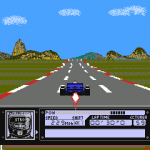 Al Unser Jr.’s Turbo Racing was one of the first NES games that I ever played, that teamed with the fact that I grew up where the eyes of the world were on my state in the month of May makes this game a complete nostalgic overload. Not only is this game important for me from a nostalgic point of view, it’s also a very good NES racing game. Sure it copied the formula so many other NES racing games did at the time, but it also had a little bit extra to it. That little bit extra is what I believe set it apart from the crowd. I loved this game as kid its really not that hard once you get the hang of it its all about the durability.